Waldman began playing piano at age five, was hired to demonstrate pianos at a local piano store at age 12, and performed with the Northwestern University band while still in high school. At the age of 21, he was hired to go on tour as the pianist for Frank Sinatra. The Lettermen then hired Waldman to go on tour from Chicago to Los Angeles, whereupon he decided to make Los Angeles his home. Within his first year of relocating to the west coast, Waldman toured with Minnie Riperton, Lou Rawls, Paul Anka, and George Benson, the latter of whom hired Waldman to be his musical director and arranger for the next seven years. In 1977, the word started to spread about Waldman in the Los Angeles studio scene, launching a prolific session career spanning over 30 years. He has performed on hundreds of albums, motion picture soundtracks, and jingles. Concurrently, Waldman branched into songwriting, arranging and producing on soundtracks such as Weekend at Bernie's, Salsa and Nuts. In 1983, Waldman was nominated for a Grammy for Best Vocal Arrangement for The Manhattan Transfer's "Code of Ethics", from their album Bodies and Souls. A few years later, Waldman's co-arrangement of the West Side Story song "Somewhere", on Barbra Streisand's The Broadway Album, won a Grammy in 1985. Waldman has been Streisand’s pianist for over 20 years and is featured on all her albums, movies and live performances. After many years working on other artists' albums, Waldman decided to release his own work. In 1998, Waldman released his first solo album, Wigged Out, featuring bassist John Pattitucci and drummer Vinnie Colaiuta. He subsequently signed to Concord Jazz and issued the follow-up, Unreel, in 2001 and Timing Is Everything, in 2003. Waldman played piano (and occasionally trumpet) on a wide variety of recordings by high-profile artists such as Barbra Streisand, Michael Jackson, Celine Dion, Madonna, Whitney Houston, Olivia Newton-John, Barry Manilow, Ray Charles, Michael Bublé, Quincy Jones, Johnny Mathis, Stevie Wonder, Andrea Bocelli and countless others. He has performed on hundreds of major studio film soundtracks including Forrest Gump, Back to the Future, Who Framed Roger Rabbit, Ice Age, The Bodyguard, Beetlejuice, Mission: Impossible, Romancing the Stone, The Abyss, and Titanic. 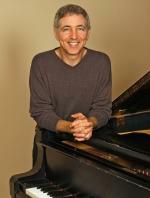 In 2007, he was the musical director for Josh Groban's Awake concert tour.Randy Waldman (born September 8, 1955 in Chicago, Illinois) is a Grammy Award-winning American pianist, arranger, composer and conductor. He is also an airplane and helicopter pilot and holds a 2003 flight speed record in a Bell OH-58 helicopter. "Violet Microphones are some of the most crystal clear and full-bodied sounding microphones I've heard. There are many great models that cover every possible application. They are amazing on vocals both male and female, and sound great on piano, drums and just about every application I've tried them on." American pianist, arranger, composer and conductor.